You may have noticed (or you may not have) that I didn’t post on Friday. I did have a tie on, for about 45 minutes, until I realized that I needed to head over to the house to deal with a plumber visit while Diane was in Asia. I figured that if there would be any plumbing detritus flying through the air, that I didn’t want that to be the story. So, I preserved that particular shirt/tie combination and changed into more plumbing-appropriate garb. By the time I was done dealing with my main man Pat Kelly (GWT alum) from John J. Cahill Inc., I decided to stretch it into a mental health day. Alors, my ensemble hung out over the weekend and made its public debut, three days after being put together, this morning instead. My Tie du the other Jour is from Giorgio Armani. I found it at Salvation Army, a couple of years ago…this is definitely not cut from the same cloth as my Tie No. 100, also from the house of Armani. Besides the fact that the stitching in the back had started to come loose (my fault, not Giorgio’s), the tie seemed pretty thin and flimsy (sorry, Giorgio). And just as I praised No. 100 for being a dream to knot, this one was just sad to tie up. Don’t get me wrong, the fabric is beautiful, rather like the skin of a speckled trout, but without the scaly feel. And without the smell, too, which is something you want in a tie. I hope the picture does it justice. We head into another month, and I feel that I should be critiquing something. Rahm Emanuel’s bid for mayor? Not until he stops tying his ties too long…Rahmie, boy, they’re not supposed to tickle the chief of your own staff, buddy. I haven’t seen any movies lately, not since The American; I still want my 2 hours back. Hmm, maybe I’ll find something soon. Until then, have a great week. 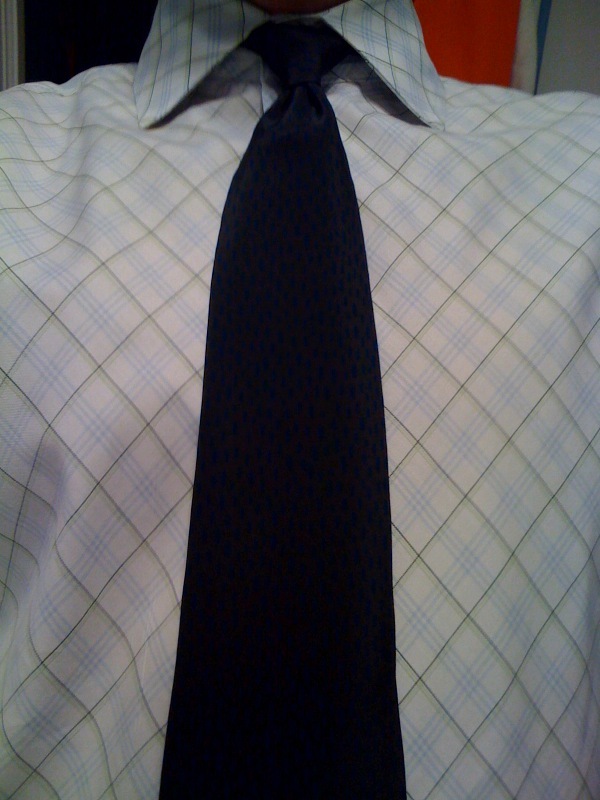 This entry was posted on October 4, 2010 at 10:49 pm and is filed under Tie du Jour, Uncategorized. You can follow any responses to this entry through the RSS 2.0 feed. You can leave a response, or trackback from your own site.